Scrubby Features: -2 -in-1 Machine Clean tight hard to reach areas using the Scrubby on its extended handle - then take off and use as a handheld scrubber. -Cordless operation: Forget annoying cords and searching for outlets Scrubby lets you work with rechargeable battery operated convenience. -Scrubby comes standard with: Trigger operated handle extension pole, 6" Standard nylon scrubbing brush, rechargeable battery and AC Charger. -Unconventional cleaning: Easily clean floors to walls, ceilings, baseboards, stairs and other areas where other cleaning machines are impractical. Generic Specifications: -Motor: 9.6V. 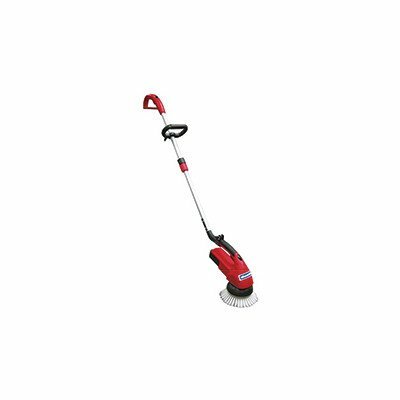 - Clean tight hard to reach areas with the extended handle then remove and use as a handheld scrubber. - Easily clean floors to walls, ceilings, baseboards, stairs and clean other hard to reach areas. - Cordless - Forget cords. Scrubby lets you work with rechargeable battery operated convenience. - Includes Trigger extension pole. 6" Nylon Scrubbing Brush. Rechargeable Battery and AC Charger.